Reference number for this case: 27-Sep-54-Fécamp. Thank you for including this reference number in any correspondence with me regarding this case. By twice and at twenty-four hours of interval one saw, from Fécamp, mysterious machines moving in the sky. Monday evening, first of all, one of our fellow-citizens of the vicinity of the sea stated to have seen a red disc moving above Yport. The guettor of the alerted semaphore prepared his telescopes, but vainly. The next day evening, however, another resident of Fecamp absolutely worthy of faith, since it is Mr. Alexandre Dubar, director of the Engineering Departments of the city, took some fresh air at the edge of the beach when he saw, in the direction of the North-West two luminous points, of ovoid shape moving vertically. Thereafter, several of our fellow-citizens were to make the same observation. As it cannot be a collective visual error, it should well be supposed that there is something mysterious in the air. 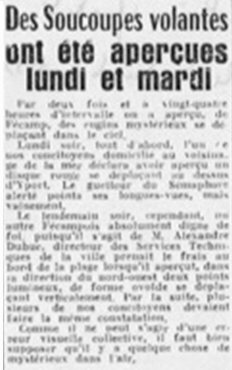 [cc1] Article in the local newspaper Le Courrier Cauchois, France, October 4, 1954. 1.0 Patrick Gross June 8, 2010 First published.